I have no idea what these are going to turn out like, but I couldn't pass them up. 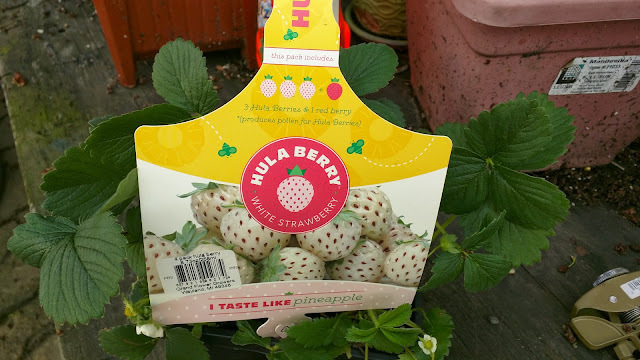 In this four-pack from Home Depot, they're selling "Hula Berry" plants. Three white ones, one red one. The red one produces pollen for the white ones, it seems. They have a Facebook page where they say they're 'going fast' in Chicago, so if you're curious about them like I was and find yourself out and about, head to Home Depot to try to pick up a set. I'm going to plant them out in the garden and see what happens. I have very little expectations, so if they do, indeed, turn out to taste like pineapple, I'll be pretty amazed.